I was asked if we could use an electric pressure cooker, Instant Pot to make radish cake via email. Definitely we can! It can be done quicker than steaming in a wok. This year’s Chinese New Year is just around the corner. 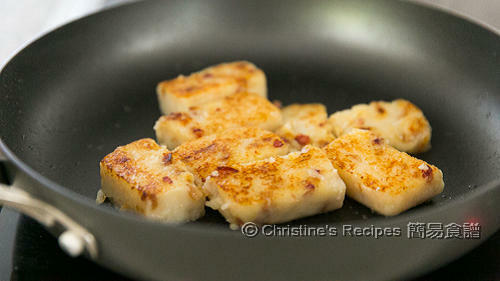 When I made radish cakes again for preparing CNY, I also shot some video clips showing the whole process step-by-step. I used the same radish cake recipe that I used year after year, only omitted the Chinese bacon (臘肉) this time. If you like to add shiitake mushrooms, feel free to go ahead. Yet remember to finish your cake as soon as you can since mushrooms won’t last too long. Chinese sausage and dried radish are salted, thus no need to season your batter with salt. You may dip your pan-fried radish cake with soy sauce if desired. Also, it goes perfectly with sriracha sauce. The taste is so good. Peel the radish and grate it into strips. I used a food processor. It’s done within a minute or so. Blanch the Chinese sausage in boiling water to remove excess grease. It also helps to cut easily. Drain up and cut into dices. Heat a little of oil over medium high heat. Add the diced Chinese sausage. Cook until oil is released. Add the dried shrimps and dried radish. Saute until aromatic. Set aside. Heat some more oil to sauté the shallot. Toss in the shredded radish. Sprinkle white pepper to taste. Stir to combine. Pour in the chicken stock. Cook until the radish turns soft and translucent. Remove from heat. Sift in the rice flour and wheat starch. Combine thoroughly. You’ll get a thick batter. Stir in the Chinese sausage, dried shrimps and dried radish. Transfer the batter into the glass containers or tin. In your Instant Pot, put a trivet inside. Pour in 1½ cup of water. Cover the lid with the pressure handle to “sealing” position. Press “Manual” button and cook for 40 minutes. Run quick release. Remove the radish cake from the pot. Let cool completely for easily cutting into pieces. Pan-fry them over medium high heat. Serve immediately. You may enjoy it as it’s when fresh from the pot if desired. The leftover can be kept in fridge for up to 2 weeks. The water content inside every radish is quite different. Adjust the amount of chicken stock accordingly. The consistency of your batter should look like the one shown in the video. Then your radish cake will be just right, neither too soft nor too tough. 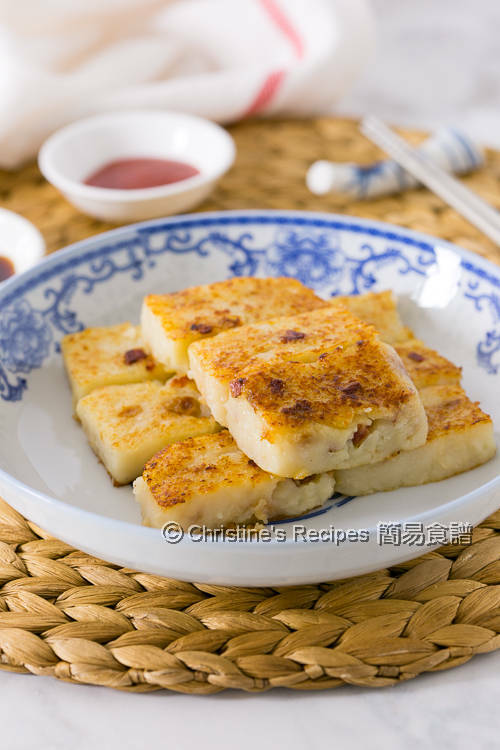 If you're going to make this radish cake in a wok, please refer to this recipe. What are the inserts you used to steam the cakes? Did they come with the instant pot? The trivet comes with my Instant Pot. It's very handy. The glass containers were bought from the nearby Kmart. 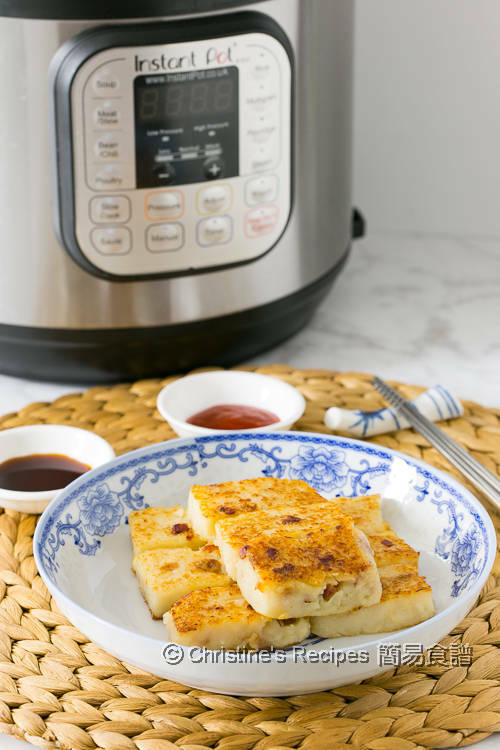 Didn't know instant pot can be used to make radish cake...that's just cool! I really like the food processor which you used to cut the radish. May I ask where you purchase it from and what brand? I online ordered from Kogan. The brand is Kogan too. Many brands of food processors have this function of shredding foods. what does run quick release mean? I just bought the instant pot and not too sure how to use it. That means you turn the pressure handle to "venting" position, so that the steam will be quick to release. Hi Christine, those glass containers look perfect in the IP! What are their dimensions? I have the 6 qt pot though. Absolutely perfect for a 6 qt IP pot. I've put the size of the glass container I used beneath the "cook time" section. Hi Christine, I don't think I've ever seen wheat starch before. Is there any substitute or can it be omitted? Thank you. It's easily found in any Asian grocer. If you can't find it, you might skip it or use corn flour / corn starch. But the texture of your end product will be very different from mine. It still work though. I haven't tested the slow cook function of my IP yet. Can you set any cooking time you want with your duo80 IP? Corn starch is very different from wheat starch. The texture of your end product will be quite different if you use wheat starch. I like your idea of using the IP to make radish cake. I would like to know if the glass container you used is oven proof? The glass containers are oven-friendly too. Do they sell the Instant Pot in Amazon Australia? If not can you recomment one that's similar? Thanks for dropping by and your love of my recipes. I've checked Amazon Australia. They don't sell Instant Pot. I got mine from Amazon UK. Did you try there? I haven't tested the product with this recipe. Can't tell how the end result will be. Hi, was wondering if the 40 minute cook time is correct? Your regular recipe says to steam for 45-60 minutes. I'm surprised that using a pressure cooker would only save 5 minutes on the cook time? I wanted to make sure the radish cakes in two separate glass containers would be cooked through in one go. That's why it took longer. The radish cakes won't be over-cooked anyway.